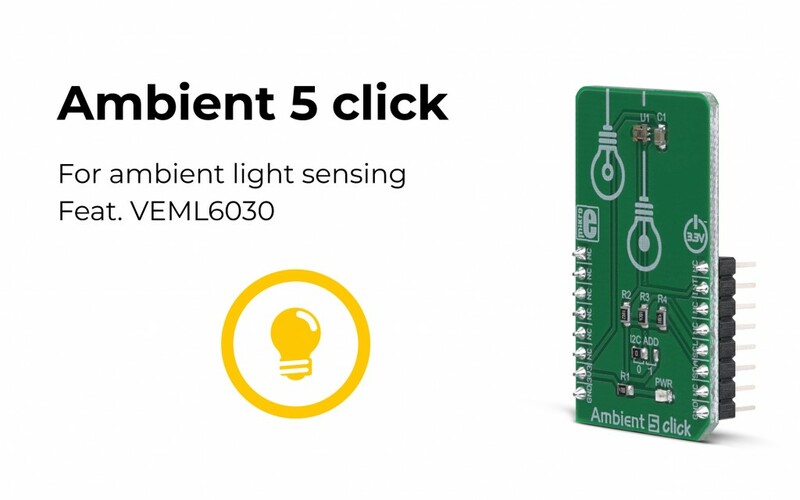 The Ambient 5 click is designed to sense the intensity of ambient light and provide you with the measurement data in a digital format, over the I2C interface. The tiny ambient light sensor (ALS) which the Click board™ features is the VEML6030. Occupying just 2x2 mm of space, it’s packed in a small, transparent casing. This sensor can provide some pretty accurate readings: thanks to the 16-bit dynamic range, it can be used in both very dim and very bright lighting conditions. The Filtron™ technology enables the sensor’s response close to human eye’s. The flicker noise rejection algorithm improves its accuracy, while the excellent thermal compensation ensures the consistency in readings. Thanks to the proprietary technologies that provide high precision, reliability, and low power consumption, the Ambient 5 click can be used for rapid development of various cost-effective applications that rely on the light intensity sensing, including optical switches, screen dimming applications for mobile and handheld devices, light metering applications (lux meters), and similar. For more information about the Ambient 5 click, please visit our website.